With the summertime coming up car daydreams often turn to convertibles, but for many people summer means loading up the station wagon and heading away for the weekend. For many years when I lived in Ontario that is how I spent my weekends. We would load the car up Friday night and drive to Rice Lake and later up to the Haliburton area. During those years I owned a number of station wagons – a Chrysler LeBaron, a Chevrolet Celebrity, a Ford Taurus, and a Subaru Outback. Those cars, to a greater and lesser extent, were serviceable cars, but the 1957 Chevrolet Nomad is one station wagon that I should have bought. I would have been driving a neat car, have more storage space, and my depreciation costs would have been considerably less than every one of the station wagons that I did own. 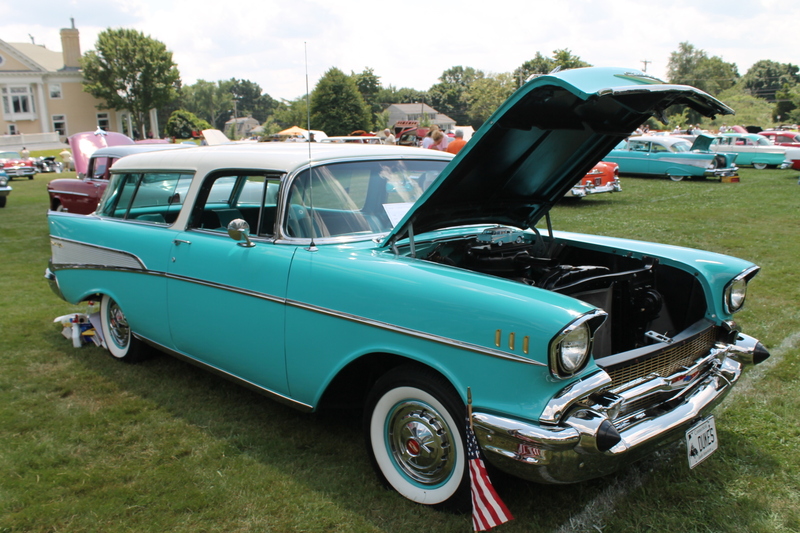 The Chevrolet Nomad was the top of line Chevrolet station wagon from 1955 to 1957. 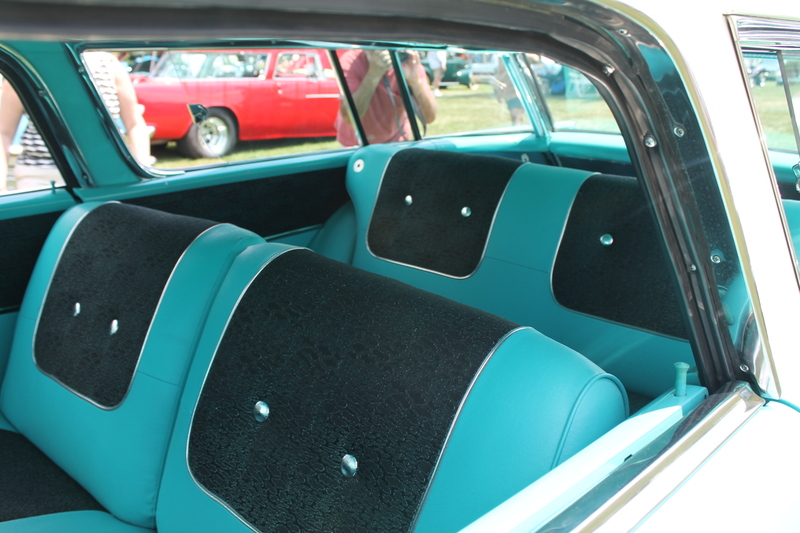 These station wagons had two doors, sliding rear side windows, and additional chrome trim. It is interesting to look closely at the above two photos. Note that in both of these photos you can see cars in the background with essentially the same paint scheme. 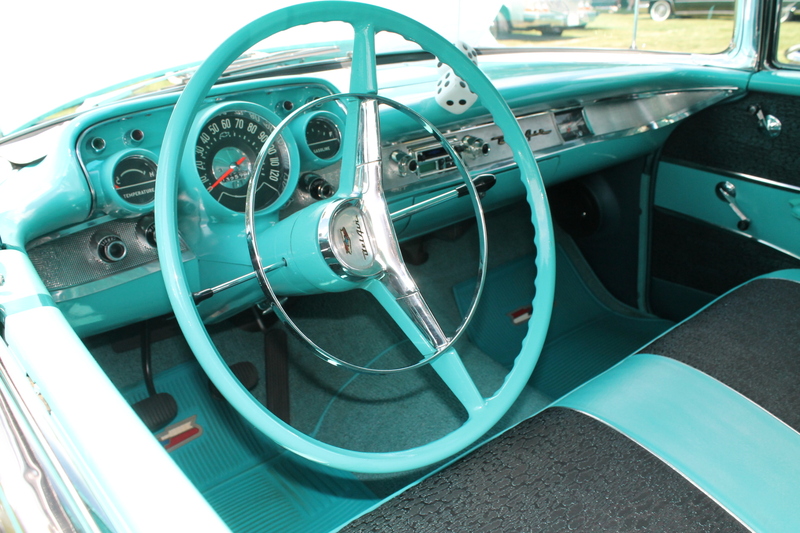 Therefore it is safe to say that the color of this Nomad was quite popular in the 1950s. Looking at the color charts for the 1957 Chevrolet cars, it looks like this car is a combination of Larkspur Blue and Indian Ivory. By the way, I feel a little sorry for people who might attend car shows 20 – 30 years from now and find themselves completely bored from looking at all of the silver or gray cars from the early 2000s. Of all the models that Chevrolet built in 1957, there were fewer Nomads sold than any other model. For example, they sold almost 8 times as many Bel Air convertibles as they did Nomads. One reason for this is that the Nomad was the most expensive of all the Chevrolets in that era. The cost of the 1957 Bel Air (top of the line) convertible was $2,511, while the 1957 Bel Air Nomad sold for $2,757. 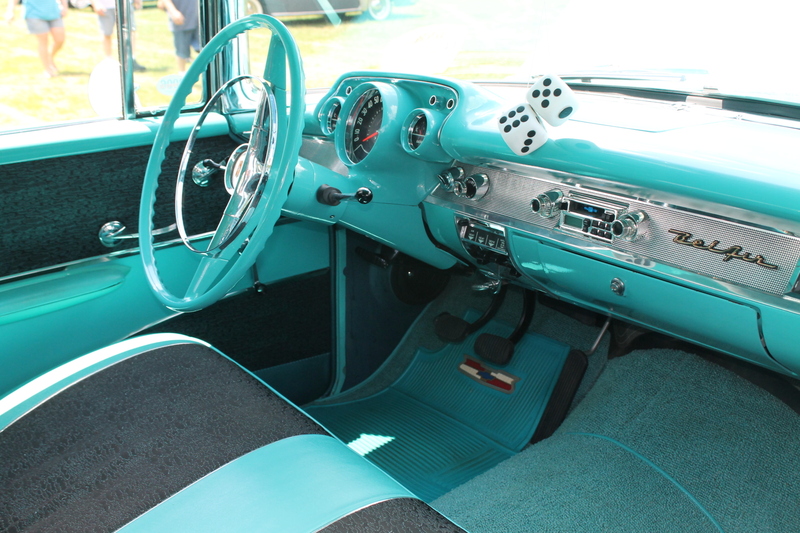 This 1957 Chevrolet Nomad has the base 3-speed manual column mounted transmission. This is often referred to as the “Three-On-The-Tree” transmission. 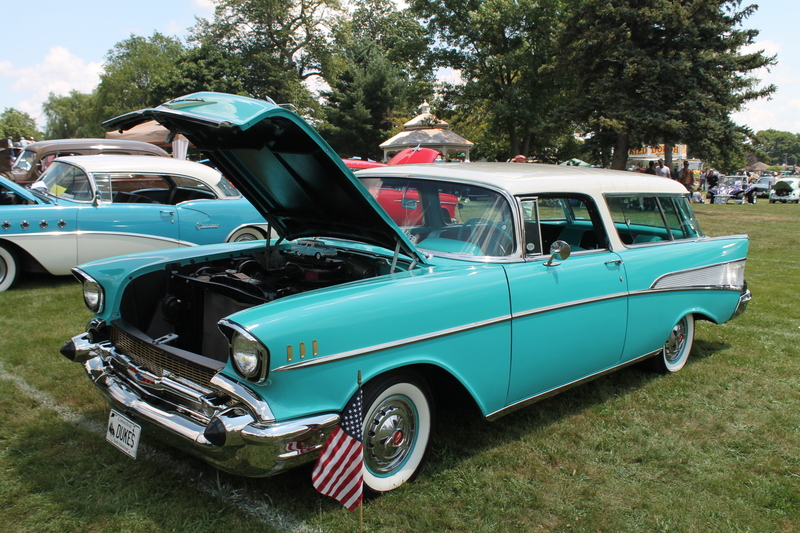 The Chevrolet Nomad was only available from 1955 to 1957 and they were never big sellers. I have some information that suggests that word was getting around that the car leaked through the rear liftgate. Chevrolet had several other station wagon models for people who wanted a more traditional station wagon design. These other station wagons sold for considerably less than the Chevrolet Nomad. For example, the Chevrolet 150 2-door Handyman wagon sold for $2,307. 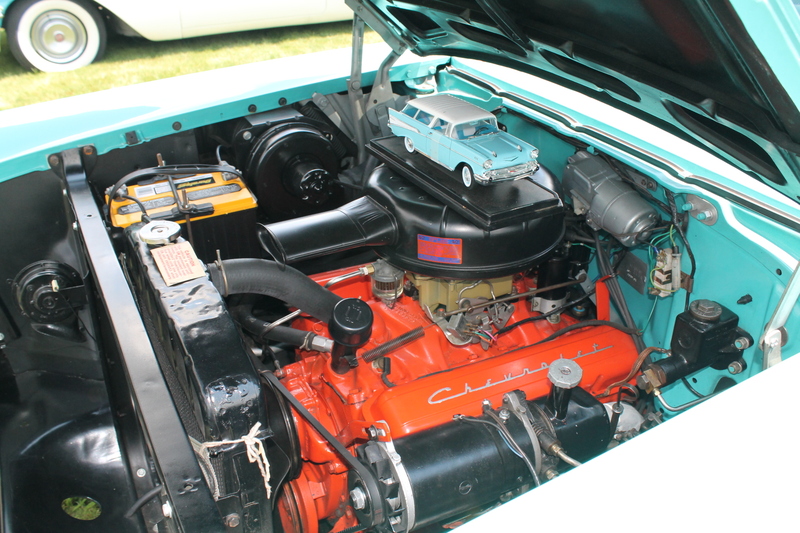 The engine choices for the 1957 Chevrolet model line-up were an in-line 6-cylinder engine with 140 horsepower, a 265 cubic inch 162 horsepower V8, and six versions of the new 283 cubic inch V8 engine that ranged in horsepower from 185 to 283 horsepower. This was the first year of the 283 cubic inch V8 engine. This engine size was obtained by enlarging the bore of the 265 cubic inch V8 engine which had been introduced in 1955. The 283 horsepower version of the 283 cubic inch motor was the first time that a standard American car manufacturer’s engine produced one horsepower per cubic inch. This was achieved by using fuel injection. Nowadays very many engines exceed that power production rate. 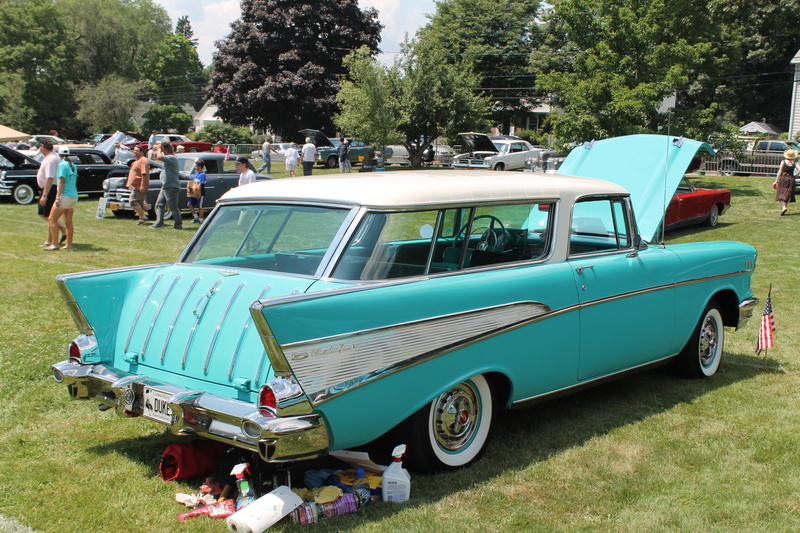 The entire Chevrolet Nomad models from 1955 to 1957 were very impressive cars. If anyone is considering a station wagon, then this would be a car to consider.